suspect holes filled, having first evacuated an Olympic swimming pools worth of water off it. 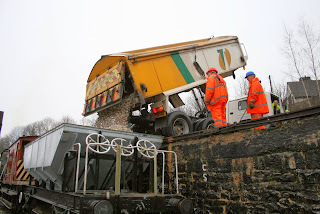 Approach was swept to within an inch of its life to get rid of several barrow loads of loose grit. The Clochemerle area was dug out in readiness to receive a quality new aggregate surface. Another day of great endeavour with the PWT dealing with a broken fishplate near 40 steps revealed by this week's essential track patrols whilst the rest of the team tended to the replacement of the Cemetery Lane cross over by digging out years of muck and laying the first of the sleepers recovered from the tram siding. The dmu team turned their attention to the locomotive hauled set to put the CK over the pit for a partial replacement of its brake blocks and then return the vehicle to its two companions. Easily said but very time consuming. They also tended to the brake adjustment of the whole set. The VCT tended to their recently delivered stone and recovered some base "sugar stone" from north of Shottle deposited there as a result of a derailment some 50 years ago - great initiative. 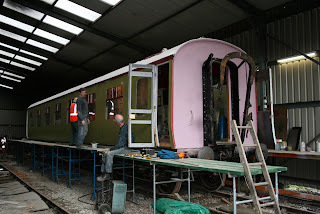 There was some more activity on the wiring of the Mark 1 coaches and painting of doors on the "Bubble Car" in the most difficult of conditions - heavy rain punctuated by sunshine. It was good to see "John the Paint" back in action. Great activity in the Booking Hall with a joint meeting with Trent Barton for their planned fun day. The Pullman Buffet Car entertained a growing number of weekday visitors. PS - this is my third attempt to send - I have eliminated the day that falls between Wednesday and Friday to see whether that works! A small but very active permanent way team continued the Wirksworth Yard remodelling project and, as will be seen in the photo, have removed some of the pointwork north of Cemetery Lane bridge for relocation. This is not an easy area to work in after spending most of the last few decades under water. The LCC and loyal husband, Barry, has cleaned the carpet in the Training Room revealing yet more roof leaks which we will need to address and also started to tackle the interior of three dmu cars presented to her at Platform 3. The LMSCA continued to attack the restoration of their Third Open and the Pullman Buffet Car entertained today's vistors brought out by the watery sunshine. The Booking Hall tended to a range of productive enquiries. I am pleased to report that Eric Boultbee has accepted the challenge of appointment as Station Manager Duffield along with his other tasks for the Railway. He will take on board all our internal and external responsibilities for our southern terminus. I trust he will receive our full support for his new task. Another Tuesday of great activity and, it has to be said, much discussion! The VCT started their day by spreading the spent ballast generously donated to improve their facilities at Hazelwood and then went on to the area of MP 134 1/4 to create a new record of four fires to burn brash and sundry vegetation with the team of seven men. A great achievement. 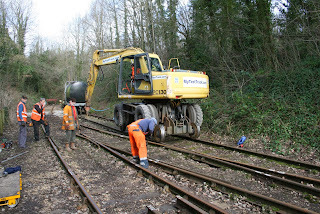 The PWT dealt with routine track patrols between Duffield and Wirksworth whilst the rest of the team gathered the chaired sleepers from the former tram siding and lifted the ironwork from the, again, former crossover north of Cemetery Lane. This project has really started to motor on whilst we have a lull in other activities over the next few weeks. The dmu team released 50253 into the sunlight, as shown in the photo, which shows the benefit of last week's sandblasting of the roof and the application of a green undercoat to the main body.The end product of a smartly turned out 3 Car set will be another great credit to the Railway. 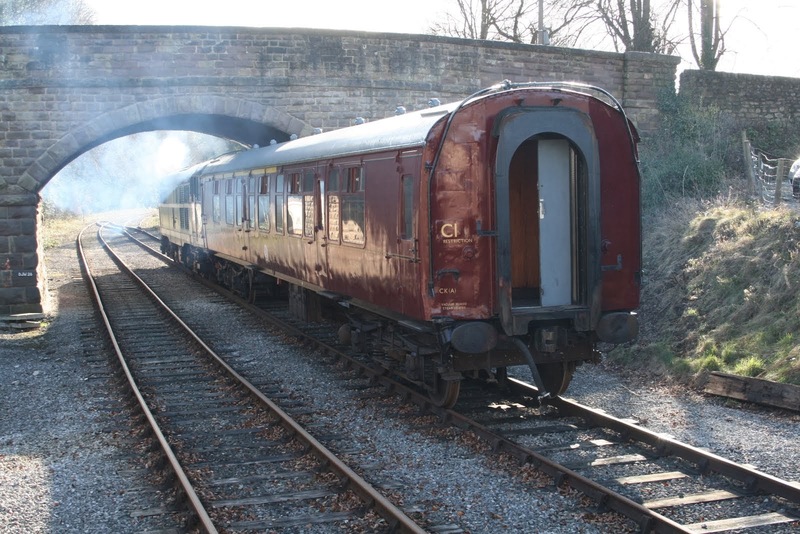 The team also shunted the LMS Brakevan and Saloon into the Maintenance Facility so that the roof of the Brakevan can be recanvased and the Saloon can be dried out. Filing Fairy 2 cleansed the Office of unwanted and out of date records ready for relocation to the Training Room complex. The DST continued with the steam heat fitting of Henry Ellison and servicing of Cathryn's springs. 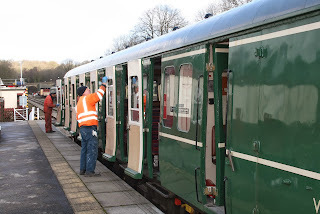 The M1M made further progress with the rewiring of the SO and SK and the LMSCA adjusted windows in their third open, continued the application of paint to the vehicle and assisted with to provision of more secure protection of various coaches being worked on. The Pullman Buffet Car welcomed today's visitors and the Booking Hall dealt with a further coach group booking. Another day of wind with extra wind kept us on our toes, and it fairly whistled under Wash Green Bridge where JCB Purves was filling a trench. The passenger service tootled up and down in its regular way and this brought a modicum of visitors to get the season going. Down the yard, the gentle routine of examinations kept half the DMU team occupied on unit 51188, and the other half spent the day painting their parts in the general area of the roof of 50253. Smiths Industries also continued painting the Third Open. Down the line, the Duffield staff froze quietly in the Arctic draught and the Station Foreman restored the lawn over a recently removed stump, as well as removing at least one bike and some other junk from a charming pile in the far end of the car park. day spent the afternoon eating it. The class 31 received routine maintenance. A lovely day on Derbyshires friendly railway as our first seasonal weekends running brought passengers out for a a steady run between Duffield and Wirksworth Behind the bubble car 55012 as well as a snack in the newly refurbished buffet car. We had a day with the driver visit with his four guests who were well looked after by John , Richard and Andrew and they enjoyed it so much they look forward to another visit so they can ride the incline in the summer. The Dmu team under took a C exam on 501188 as well as applying the first coats of paint on the roof and sides of the 101 unit 50523. The Lmsca applied paint to the third open as well as tinkering about with other minor issues. The duty conscript finished the path to the picnic area before retiring to the mess room for a well earned cuppa. The gardener braved the cool weather as she tended the platform garden. Quite a pleasant day for February, although a twinge chilly in the wind. way through a large amount of brash removed from the school embankment, this is now almost as pristine as in the days of Phil Tarry and the phantom flail, and appears to be a precursor to work on the embankment wall. Down the yard the main sound emanating from the shed was the drilling of plating for the doors to the Third Open and the popping of paint tin lids as more paint was applied. Nearby the Marks and Spencer DMU team worked on the cab and on painting the cab desk panels. The Booking Hall mainly resounded to the sound of counting as Perkins the Careful recorded a number of things which haven't been recorded since Channel 4 lost all sense of reality (2003). Meanwhile, the Foreman returned the Picnic Area fencing to its nearly normal (i.e. only slightly worn) state and the buffet celebrated the arrival of a fantabulous new coffee machine by hanging a flag out. A photo that will be part of history over the next few weeks as the cross over north of Cemetery Lane bridge is prepared for removal and relocation as part of the enabling works for extension of the Maintenance Facility. As ever, progress will be determined by the pace we can raise funds for this exciting development. 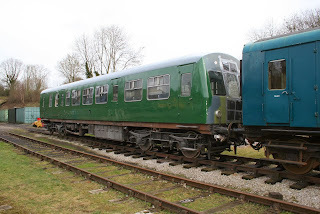 The dmu team were out in force to ensure the Class 119 remains in tip top condition dealing with a battery switch renewal, resolution of a slow acting fire prevention device and a tightening up of the engine mountings. 55006 received further attention to its interior and work continued within 50253. The team has also adopted the maintenance of L J Breeze and fully greased the locomotive discovering that a lighter oil is designed to ensure the forward and reverse clutch works well. A good bit of detective work which will be addressed next week. FF2 (Filing Fairy 2) made progress in ensuring all competences were recorded and gaps in our defences identified. At Duffield the door to the Ladies was sorted as we welcomed a good turnout on today's service trains. The first ever Zig Zag Choo Choo group was welcomed with a most interesting take that the offer was very good value as the main participant could bring his family and then use the ticket into Derby tonight for a little light refreshment as it doesn't expire until 0400hrs tomorrow! The Pullman Buffet Car had quite a good day and amongst today's travel clients the Booking Hall managed to sell another Bronze Steam Experience. We also launched the online offer for the new Tuesday Pullman Afternoon Tea and Train - a quality product that will appeal to our more discerning customers! Another mild and fairly pleasant day that saw the VCT returning to the area around MP 1341/2 for further cutting and burning with the PWT dividing into two team to attack tasks at Duffield, Hazelwood and Wirksworth. The Duffield project was completed by the removal of surplus and redundant material, the spend ballast was deposited at Hazelwood to improve the road-rail interface there and Wirksworth saw the partial deconstruction of the Tram Siding as this major project starts to prepare for Maintenance Facility extension in 2015. In the Car Park dmu car 50253 had its roof sandblasted together with similar attention to the sole bars saving hours of volunteer manual work. The LCC tended to the CK in our loco hauled set whilst the LMSCA struggled with the reupholstering of their Mark 1 SK. The main man at Duffield reported that he had cleared leaves and branches from the north end of the car park and started to deal with a sticking door on the ladies toilet. The Pullman Buffet Car benefited by a trickle of half term visitors to Wirksworth and entertained a guest from Twinings Tea as we move towards a spectacular offer for Afternoon Teas on Tuesdays, think Savoy or The Ritz, which will be launched in the near future. The Booking Hall dealt with another promising coach booking and started the process of another major mailout to coach operators. This is all part of the Focus on Footfall and Families, the latter addition caused by a prod from Mary that this market is also a key to the future. Today's photo is of a fence, not just any old fence, but one that Network Rail have replaced for us on the footpath to North End, Wirksworth with our grateful thanks. A dry and fairly mild day commenced this year's running season with "Iris" and we were pleasantly surprised by the number of passengers and visitors received. We also welcomed a recently retired East Midlands Trains driver and his former manager from Nottingham. They were hosted by Tom Tait and were pleasantly entertained at Wirksworth with a "driver experience" on the Class 31. The Pullman Buffet Car got into its stride after the winter closure and will now be open every day except Mondays until the end of March when daily operation will recommence. It is pleasing that some of our regular diners returned after a fallow period. Fred & Iris were present to tend the Mess Hall but didn't quite shame everybody to wash their pots - the absence of any crockery might deliver the message? The Booking Hall seemed to have an indication that the vastly improved layout will encourage sales with some 10% of their take being from retail. The lone VCT member serviced some of their kit and the PWT dealt with outstanding adjustments to Duffield North Ground Frame whilst the rest of the team dealt with drainage. The Duffield loop is now returned to full operation. The DST were continuing with the fit of steam heating to Henry Ellison and a multitude of tasks on Cathryn. The LMSCA were striding on with the Third Open panelling doors, fitting sliders and mending cables slightly affected by shunting. Their coach is illustrated with the product of eight coats of undercoat! The volunteer from the Rolls-Royce mafia has taken the Komatsu's offending part to machine a replacement. I am told that the hyphen is all important! My thanks go to Eric Boultbee who hosted yesterday's test customer that was quite frustrating for them as the machine didn't leave the Car Park. Nonetheless, there is a silver lining as more work should be coming our way. The dmu team were occupied all day in emptying the "Tram Road" as the first part of the plot that will occupy most of this year to reconfigure Wirksworth Yard to shorten the run round and prepare for the extension of the Maintenance Facility. This will occupy the PWT probably to September and will result in the advance works being complete for further progress in 2015. 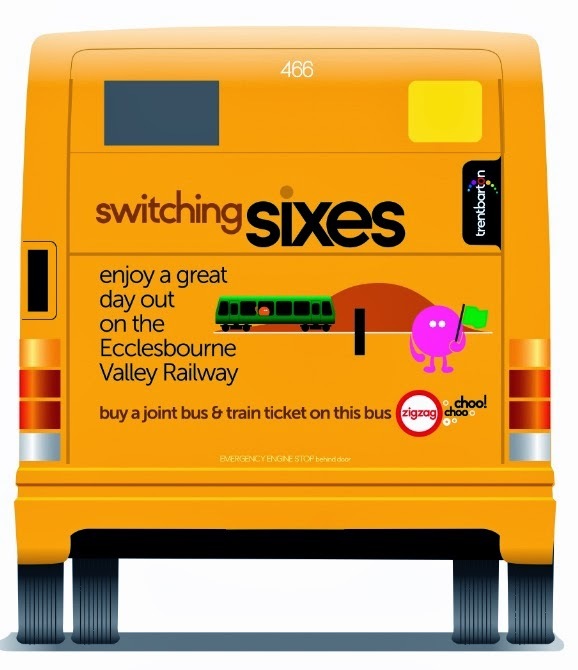 The other picture attached to today's report is a sample of the rear of two buses that Trent Barton will field as part of the Zig Zag Choo Choo marketing. Three cheers to Leigh who has cemented relationships with the Company that will result in moving promotions for us. A rather lovely, dry sunny winter day here today, which brought a number of visitors enquiring about the services: which start again on Tuesday land also run this coming week on Thursday, Saturday and Sunday for half term. This will be the winter timetable of the Duffield line only that is the 10.15, 12.15 and 14.15 from Wirksworth. I am sorry for those of you waiting for Shottle Station to open, we still lack the money to tarmac the platform and complete some other essential matters: Shottle will not be served before Easter. Meanwhile our hoary handed volunteers continued with some crew training and efforts to seal the Duffield Booking Hall floor. Down the yard, the DMU team, as ever working on unit 50253, cut a new cab desk top and carried on with assorted repairs to the passenger compartment door frames, and routine maintenance to our other units. A very wet day on Derbyshires friendly railway in fact so much rain fell today that we had are own swimming pool in the car park. Three members of staff attended and passed the first aid course . The duty conscripts did further work on the picnic area footpath in between showers. Th Dmu team did further work on 50523 in the shed area ready for the shot blasting . Iris trundled down the line as we hosted a Trent Barton special experience with Leigh ,Ollie and Tom. Lmca where to be found door knocking on the third open in the Shed. All in all another productive day was had by all who braved the bad weather . weights and tried to start their machine in the pouring rain. occasionally use the Dust Dock Gates, please note this work is not yet completed and the gates should be opened only with care. a delightfully vast and profitable booking in a very soon moment. 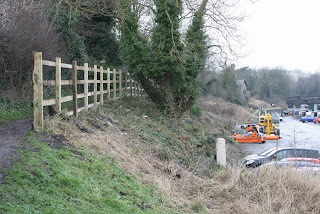 Quite a day again with another surprise from the Network Rail contractors as they renewed some of the fencing of our concessionary footpath to West End at Wirksworth - just say thank you! The dmu team transferred their efforts to the locomotive hauled set as buckeye couplings were checked and gauged. Today's photo shows the Class 31 and CK which were part of the exercise that was very thorough and very useful for the continued operation of these vehicles. 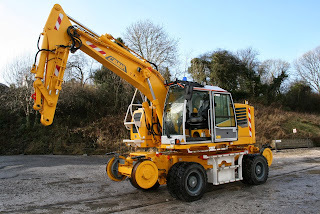 Splendidly we had two test customers on site with Mick Thomas looking after the machine from yesterday and a brief visit from the "walking stick" team. 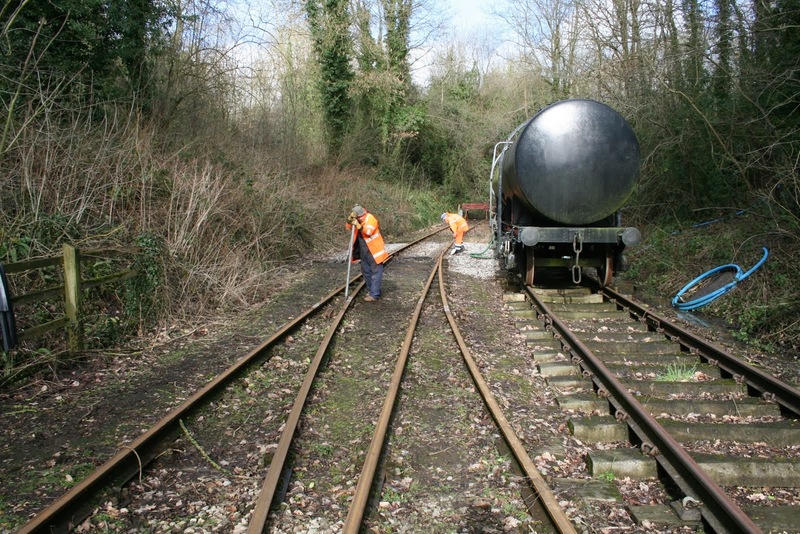 The LCC concentrated on Iris and it now fair sparkles and the PWT completed the ballast fettling at Duffield. They also patrolled Idridgehay to Wirksworth with no problems encountered from last evening's high winds.The VCT also travelled in their Landrover between Duffield and Idridgehay, again with no problems encountered. It is a great tribute to their work that the line does not seem to encounter the fallen tree problem. The VCT then concentrated on an area around bridge DJW 11 which is the Derby Road bridge between Idridgehay and Shottle. Anne and Martin from the catering team gave the Pullman stock a further deep clean as we ready ourselves for the start of service next Tuesday. The Booking Hall dealt with a number of enquiries and our work placement pupil from Anthony Gell had a visit from his tutor. She remarked he has noticeably grown in confidence as a result of his short time with us reflecting great credit on those members of our team who have taken him under their wing. Most of the day was incredibly nasty with driving rain suddenly relieved this afternoon by the sun but the arrival of our test customer was subject to a number of problems that will be resolved tomorrow. These problems were none of our making and demonstrate the value of testing away from the wider world! The machine illustrated has travelled for several days from Italy to be with us and will be put through its paces tomorrow. Many thanks to Eric Boultbee who had a frustratingly very wet day. The PWT, again working in the most unpleasant of conditions, largely completed their task at Duffield leaving a modest jacking and packing tomorrow together with some adjustments to the Duffield North ground frame. Rather surprisingly, but nonetheless welcome, Network Rail contractors arrived to clear the bank above the car park wall but did not achieve the high level of productivity seen from our own VCT. A by-product is that the Talking Tunnel is silent again! The LMSCA discussed a lot and reported that their project had "progressed". A lone worker continued to reconfigure the Pullman Buffet Car probably incurring some comment from his long suffering wife for the time spent on the task. I omitted to mention yesterday's endeavours by the dmu team who checked 50170 for air leaks and serviced the battery on the Met-Cam centre car. My thanks go to the respondents to my pleas for the Komatsu part. Three cheers to Paul Rayner who has found a prospective machinist from the Rolls Royce old boys, a significant mafia! The Booking Hall progressed a significant mail out to coach operators through a third party. This will be instructive as to its efficacy. Quite a day again with the morning being absolutely foul, the afternoon sunny and the evening very cold with snow threatened overnight. The DST has been continuing with their endeavours to fit steam heating to Henry Ellison and fettling Cathryn's parts as far as they can. The M1M continued with their renovation of the vehicles from Long Marston wiring up the SO and SK to deal with 12v electrics and hinting at quite exciting developments to use the new wiring to deliver public address and a possibility of gps positioning. The Wirksworth Power Box is moving ever closer. The VCT concentrated on the area between MP134 1/4 and MP 134 1/2 to open up view and dispose of redundant assets. A six man team turned out and two large fires were fuelled by their activities. 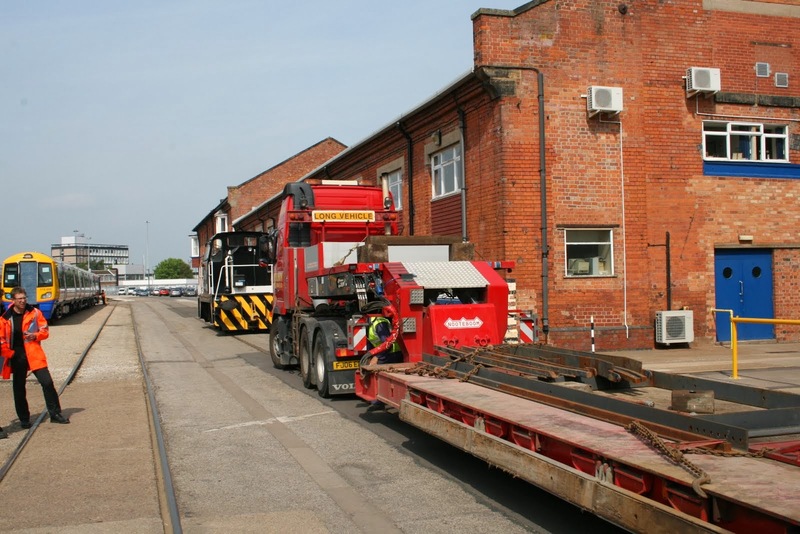 The PWT concentrated on the Duffield project with part of the team waiting on the delivery of white gold illustrated, transported it to site and deposited this expensive product to allow jacking and packing of the Duffield North Junction turnout. Conditions were far from ideal but the afternoon allowed a successful conclusion to the day. 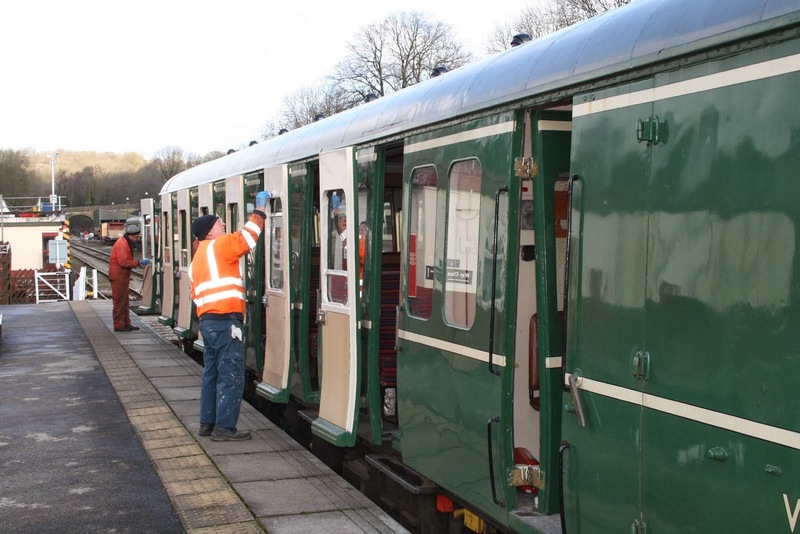 The Pullman Buffet Car team cleansed the vehicle as they approach a return to normal service next week and the Booking Hall dealt with the weekly administration together with preparing for a further mail out to coach operators. A bronze steam experience was sold and measurements were taken for our planned market stall weekend. The LMSCA were out in force and after some pressure revealed that they were installing sliders in the Third Open, routing blind boxes (not destination blinds but carriage window blinds! ), preparing and fitting the gangway tread plate at the south end of the vehicle, paining the undercoat on the west side and refurbishing the drop lights. Much tea was also consumed. Filing Fairy 2 was also putting in a good day's work on the unending task of maintaining our records. Preparations have also been in hand to welcome a test customer tomorrow which may provide some excitement over the next seven days or so. PS - The second photo today is of a Spline Drive Collar from the hydraulic motor of the McConnell Flair Hedge Cutter fitted to the Komatsu. 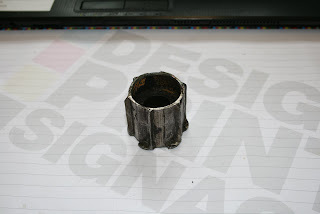 This is badly worn and all attempts to source a replacement have been exhausted. However, there may be one of our reader that has a solution! Quite chilly and a bit damp here today. Several teams were on site doing various things including shop and shunting training (not both at once). 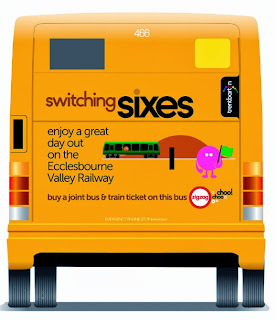 several new shunters were encouraged to use their whole arms in accordance with the Rule Book so that drivers can actually see them. Smith's Industries was at work on the Third Open, sanding the west side as part of the vast painting work which this vehicle is receiving. Nearby, the DMU team carried on with 50253 and completed a replacement cab door pillar and a number of door backs, and Village Green carried out a B exam. stall at our Crafts Weekend on the 20th and 21st September, please contact the ticket office at ticketoffice@e-v-r.com as we will shortly be starting a list, I should make it clear that this will not be a Railway Stand Weekend. work, to make the horn work. backs and the gutter ends, or beaks as they are known to the locals. lamps. All we need now are some new batteries to go in them. pans. The soup dragon will be here to fill them up in a very soon moment. We must congratulate Bombardiier on winning the Crossail order so today's photo shows our workhorse, LJB at Derby, dontated by Bombardier and without which our eneterprise would not have moved forward. The PWT continued to restore Duffield to operational safety and delivered the Works Train back to Wirkworth with a Dogfish hopper wagon to receive some white gold on Tuesday. The dmu team concentrated on the Centre Car of the Met Cam set for its "A" examination and the Pullman Buffet Car received a new water heater which was fitted in a location that benefits from a contortionist. The Duffield contingent has removed the dead silver birch and has plans for a soakaway in the whole left by is roots. Today's photo supplied by Richard Buckby illustrates the use of a "Jim Crow" as part of the Duffield North refurbishment. Hat's off to the PWT for continuing to work in the most unpleasant of conditions which were wet and cold but a little less alarming than events on the south coast. The LCC returned to duty after domestic renovations and started to cleanse the locomotive hauled stock which have deteriorated in the dank conditions over the last few months. I omitted to mention the sterling work yesterday in the Pullman Buffet Car where a leak in the water heater located in the most difficult of spaces revealed a new piece of equipment will be required. There has been much behind the scenes work to accommodate a new large test machine winging its way from Italy and should arrive next week. The Booking Hall captured another group booking and bronze steam experience. The DST have exposed the extent of the lack of maintenance of Cathryn where boiler washouts seem to have been neglected in its last years of service. Nonetheless they have continued to explore the fitting of steam heating to Henry Ellison and tended to Cathryn's value gear and horn guides. The PWT continued with their significant project at Duffield and the VCT declared themselves content with the removal of blackthorn in the area of MP 134. Two significant fires satisfied the team of four that their day had been productive. The dmu team tended to various areas of maintenance and presented to the Class 119 to the Matlock Mercury for a suitable photo opportunity. The LMSCA celebrated their construction of a steamer to aid the formation of roof supports and applied more final fix filler to the Third Open. Fred and Iris made a welcome return to cleanse the Mess Hall and the Booking Hall continued with the acquisition of business for the approaching season. We have made some changes at the "top" - Mike Evans is now Operations Manager and Motive Power Superintendent and Tom Tait is now Commercial Manager and Health & Safety Advisor. I hope you will support these changes as we adjust to our enterprise growing in strength and numbers. A significant milestone has been achieved today as we are now a preferred supplier to Network Rail - watch this space for the activities associated with this accolade. hive of activity at the railway as various small teams beavered away around the site. the door backs were stripped for sanding and more parts of the cab desk were dismantled. Three of the main windows were replaced following new seals being fitted, part of the important process of ensuring the vehicle is watertight. weather to paint more wheels and the reversing parts of their engine. was extracted prior to its replacement. visitors which the sunny weather had brought out. This also brought out he Guerilla gardeners who were no doubt happy not to be sodden about their tasks. refurbishment and also received a lick of paint as well. frying pan as we appear to be entirely panless at the moment in the general area of the Mess Room. A very cold an wintery day here on Derbyshires friendly railway as we completed more inhouse training for our new staff. Our two duty conscripts were kept busy refurbishing the path to the picnic area.at the end of platform 3. Mike and Jacob were to be found resolving the coms and proposed emergency brake issues in the pullman coaches. 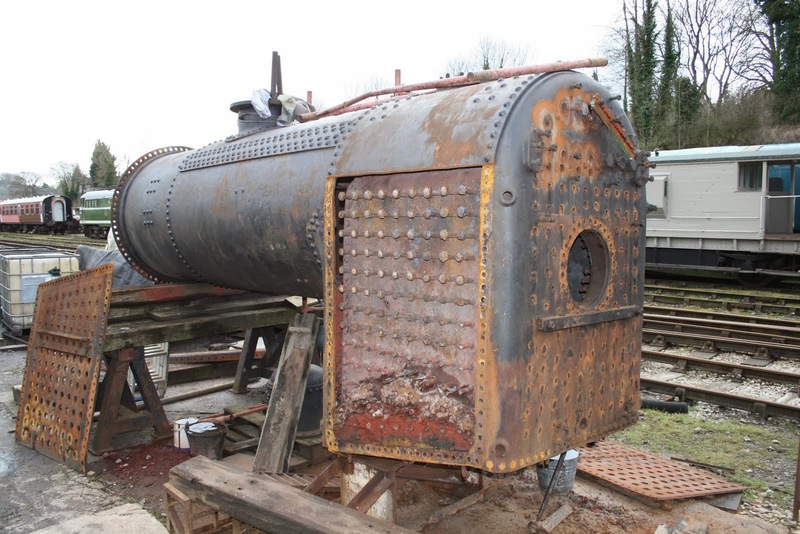 The 8f group made further inroads removing the firebox panels off kathryn. The Lmca completed further work on the doors and gangway of the third open. The Dmu group were to be found hard at work on the ex Sthrathclyde unit..
Micheal and Ross manned the Booking office helping to produce the New PTS cards. Now im off for a well deserved coke in the Crooked spire public house were Im assured its nice and cosy.